Microsoft under Chinese Antitrust Scrutiny? Yesterday, July 28, the Western press, including the Washington Post and South China Morning Post, as well as Chinese online media reported that the State Administration for Industry and Commerce (SAIC), one of China’s three antitrust regulators, was investigating Microsoft for possible antitrust violations by visiting Microsoft’s offices at Beijing, Shanghai, Guangzhou and Chengdu. Chinese IT analysts suggested that if there were an antitrust investigation, it would involve Microsoft’s operating system, which controls 95% of the market. However, analysts also noted that while PC OS has not been a principal focus of attention of China’s antitrust regulators, China has potentially eight domestic competitors to Microsoft in the OS sphere, and that there market share has been growing in part through government procurement efforts. While OS is a basic platform for building computer systems and services, these analysts noted Microsoft’s technological depth in this area has brought it many competitive advantages. One hopes that Chinese regulators note that the 95% “market” dominance figure that is being discussed necessarily refers to the legitimate, non-pirated market only since Microsoft’s chief competitor in China is likely the stolen pirated versions of its own software. The limited news that is available makes it difficult to infer much. SAIC handles non-pricing related investigations involving monopolistic agreements, and abuse of dominance. In recent months, however, NDRC has undertaken several price-related antitrust investigations. SAIC is a vast agency which also has broad authority in a range of IP and market regulation areas, including “abuse of IP” pursuant to article 55 of China’s Antimonopoly Law as well as supervisory authority under China’s contract law. China does appear to be more clearly expanding its efforts to regulate technology markets. These efforts began even when there was an unclear legislative basis. The press had reported that Microsoft had been reported to be the subject of an antitrust investigation by SIPO in 1998, which thereafter led nowhere except to a flurry of denials. In fact, as I noted in the 2011 book I coauthored on Antimonpoly Law and Practice in China, MofCOM Vice Minister Yi Xiaozhun complained even before implementation of the antimonopoly law (2007) of high licensing fees “running counter to fair competition”. More recently,the Huawei/Interdigital case appears to have been a harbinger of a more active role by the government, particularly NDRC, in regulation of foreign players in China’s technology markets. These days at conferences no one seems to doubt that China is interested in IP protection. The “goods news” remains that China is interested in IP. Unfortunately, the bad news is also that China is interested in IP — as a tool of development for its “socialist market economy.” Striking the right balance will be a critical issue for both China and its trading partners in the years ahead. The opinions expressed above are the author’s own. On July 8 the State Council released a new opinion on “market order” which, like many similar rules in China, is suggestive of possible significant policy changes, while being of uncertain legal status, all cloaked with a rather unappealing title. The document is called “Several Opinions of the State Council Opinions on Promoting fair Competition in the Market to Maintain the Normal Market Order.” 国 务 院 关 于 促 进 市 场 公 平 竞 争维护市场正常秩序的若干意见国发〔2014〕20号 (http://www.gov.cn/zhengce/content/2014-07/08/content_8926.htm). “Market order” is a term that has significant overlap with IP protection and antitrust matters. It has appeared in the draft patent law revisions of SIPO, and was also the basis for MofCOM’s earlier efforts at coordinating IP protection through the Market Order Rectification Office. Of course, some laws and regulations, such as those involving consumer protection and unfair competition, have a more direct relationship with what many Westerners may conceive as “market order”. These opinions point out some of these, such as by calling for “the strict implementation of the financial, food and drug safety in production.” However, in China the term is arguably broader. For example, this document calls for an expansion of joint liability concepts and of punitive damages when harm is caused to the “market order”, which are usually civil – rather than regulatory – concepts. The “guiding ideology” of this opinion is positive. It is intended to provide for “equal protection of the legitimate interests of market players, maintain market order of fair competition and promote the sustained and healthy development of economy and society.” The document “insist[s] on the use of the rule of law in …market regulation functions.” Procedures should also involve “government regulatory standards of openness, the process is open, the results made public,” thereby echoing current efforts in IP administrative transparency as well as commitments to make AML procedures more transparent (see: https://chinaipr.com/2013/11/24/through-a-glass-less-darkly-chinas-march-to-administrative-enforcement-transparency/). The Opinion also calls for “severely punishing monopolistic conduct and unfair competition conduct” in accordance with the relevant provisions of the antitrust law, anti-unfair competition law, and the price law. It also addresses monopolistic agreements that “hamper innovation and technological advancement.” Other concerns are: false advertising, price fraud, commercial bribery, illegal lottery sales, business defamation, laws to protect all types of intellectual property rights, the fight against manufacturing and selling counterfeit and shoddy goods, etc. The Ministry of Commerce, Development and Reform Commission, State Administration for Industry and Commerce, Intellectual Property Office and other departments were responsible for implementing this provision. The Opinion also calls for efforts to “to resolve duplicate law enforcement.” Some of this appears directed to efforts to integrate culture and copyright protection through local task forces. However it does not appear to be specifically directed to antitrust and unfair competition, particularly in its call for “the elimination of duplication multilayered enforcement”, including territorial and subject matter overlaps. The antitrust subject matter overlap appears acute to me at this time between NDRC (pricing law) and SAIC (IP abuse) at least with respect to standards essential patents and licensing. Considering existing overlaps in copyright (through cultural task forces), trademark (through overlap with AQSIQ, MIIT, and others) and that China has a three-track system for enforcing antitrust matters (MoFCOM, NDRC, and SAIC), efforts to minimize duplication and achieve enforcement by laws that are consistently implemented throughout the country may yet be difficult to achieve absent more extensive reorganization. 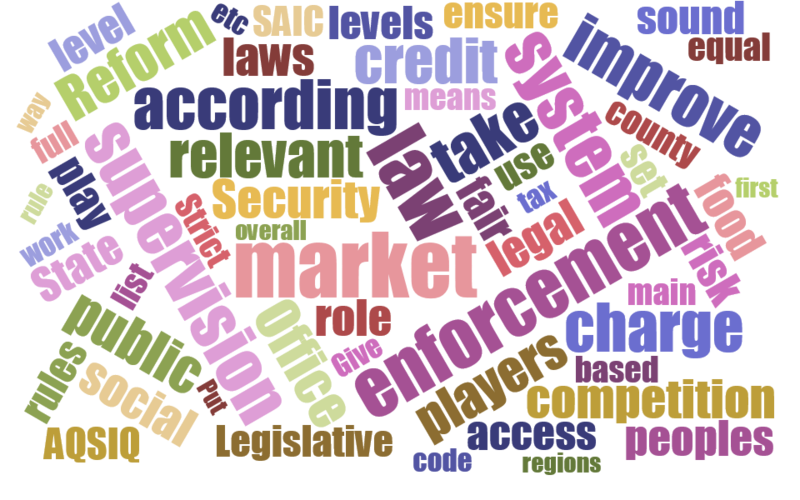 Note: The word cloud, above, drawn from a google machine translation of the document suggests a robust role for “supervision”, “market” and the “law” to promote “competition”, which one hopes is the prerequisite to a more robust role for the market, and not simply by market regulators. As usual, these are my personal non-official observations. Of Counterfeit Pandas and African Lions…. Want a glimpse of a counterfeit panda? Go to: http://www.sznews.com/humor/2012-06/08/content_6820640.htm. Fake pandas are easy enough to counterfeit – if you don’t mind painting up a shizu or other dog and hope that it doesn’t bark too much. The Chinese press labeled these “shanzhai” (counterfeit/mountain stronghold) pandas, back in 2008. This “innovation” appeared to have first appeared in Jilin Province. Jacob Johanson recently posted on linkedin, another story – about a counterfeit African mountain lion in a Henan zoo. (https://www.linkedin.com/groups/IN-CHINA-EVEN-ZOO-ANIMALS-4972308.S.5891817830172626948) In this case the mountain lion was a dressed up Tibetan mastiff, at least according to Chinese news reports in 2013 (http://pinglun.eastday.com/c10/2013/0818/20675630.html). Unlike the counterfeit panda, the Chinese media has suggested that the counterfeit mountain lion could have been created to fraudulently draw visitors to the zoo. There are many other notable China inspired counterfeits. Domestic cultural treasures like the terra cotta warriors have been charged with fakery (https://chinaipr.com/2014/02/23/truth-or-false-dream-of-the-red-chamber-and-the-terra-cotta-warriors/). My favorite is the fake jail that manufactured fake cigarettes.(https://chinaipr.com/2014/06/09/jail-house-inventors-and-fake-jail-infringements/). Living in China you might also notice when other countries engage in this type of fakery. Consider for example the Wa state in Burma, which some Chinese consider a counterfeit (shanzhai) version of China. (http://archive.today/cF98A). The US and China recently concluded their Sixth Strategic and Economic Dialogue. IP-related outcomes involved such areas as: trade secret protection; cooperation with China’s judiciary; and software procurement. In addition there were other outcomes with IP-related deliverables in such areas as antimonopoly law and control over active pharmaceutical ingredients. The United States and China affirm that they do not approve of trade secret theft for commercial advantage and that the protection and enforcement of trade secrets is essential to maintain fair competition and to develop an innovative economy. Both sides are to pursue criminal and other actions to deter the misappropriation of trade secrets, and make information available to the public about their actions, to the extent permitted by law. China has incorporated the protection and enforcement of trade secrets into its 2014 Priorities of the Nationwide Crack Down on Intellectual Property Infringement and Production of Counterfeit and Shoddy Products, published by the State Council on April 14, 2014. As its next step, China is to vigorously investigate and prosecute trade secret theft cases; ensure that civil and criminal cases are tried and the judgments are published according to law; and protect trade secrets contained in materials submitted by companies as part of regulatory, administrative, and other proceedings according to Chinese law. China is also to undertake publicity and education activities to improve the awareness of companies and the general public regarding the protection of trade secrets; to undertake studies and research on trade secrets law and related legislative and policy issues; and is to continue engaging in technical exchanges with the United States on these issues. China affirms that it is to continue prioritizing trade secrets protection and enforcement and is to take positive actions that are to be included in upcoming work plans. …Further, the United States and China commit to strictly implement existing laws and regulations to adequately protect any trade secret or sensitive commercial information provided by the applicant during the administrative licensing or approval process, consistent with laws. discussions and any recommendations are to be reported to the JCCT and other bilateral meetings. China confirms that the Deployment Standards for the Assets of the Office of General Software of Government Agencies is a measure designed to strengthen the administration of spending and implement the CPC Central Committee’s call for frugality. This measure was drafted with the intention to not have any purpose or effect of creating obstacles to international trade. The United States and China are to continue to engage on ways to address any obstacles to trade facing companies. To advance the shared goal of ensuring access to safe and high-quality medicines for patients and protect supply chain integrity, to affirm the responsibilities of the manufacturers and regulators over the life-cycle of the drug to ensure product quality, and to fight against illegal actions to manufacture, distribute, and export counterfeit and substandard active pharmaceutical ingredients (APIs) and APIs used for counterfeit and substandard products, China commits, during the process of revising the Drug Administration Law (DAL), to develop and seriously consider amendments to the DAL requiring regulatory control of the manufacturers of bulk chemicals that can be used as APIs (“bulk chemicals”), including “export only” producers and distributors. To this end, China commits to hold a multi-ministerial work mechanism on a potential regulatory and enforcement framework to develop the oversight of bulk chemicals, and a roadmap for implementation, by the end of this year. The United States commits to continue to review its authority to exclude from consideration the import of bulk chemicals from firms that are not registered with China Food and Drug Administration (CFDA). In addition, the United States and China commit to deepen technical exchanges, trainings, and regulatory cooperation to enhance the safety of bulk chemicals traded between the United States and China, and to exchange views on the user fee programs at the upcoming pharmaceutical working group meeting of the JCCT. There is also a separate US Fact Sheet which further elaborates on these deliverables. The American Bar Association has just released its comments on the SAIC IPR Abuse Guidelines which are available here. USPTO’s “All you Ever Wanted to Know About Chinese IP and More” will be held at the PTO’s Global IP Academy *http://www.uspto.gov/ip/training/index.jsp) on the morning of July 18 in Alexandria, VA. Updated agendas will be available on line. The program is free, but pre-registration is required and a fee will be charged for lunch. The afternoon session is for US government only. I look forward seeing you there! To register for the event, log onto the online registration site: http://events.Signup4.com/ChinaIP.